I don't know about you, but here is freezing cold, and have I mentioned I hate winter? Anyway, I am here today to discuss last week on our favorite game. Without further intro, here it goes. On Monday, we got new Winter Peak interior collection. Items are nice, perfect for winter, as they give an impression of cozy feeling. There are many nice items, and some really interesting and unique. There is that adorable rabbit, a pillow pith paw prints on it, and many other nice room accessories. On Wednesday, we got new collection in Bonjour Bizou. Again with winter theme, with coats, scarves, sweaters, etc. Items look good, I love sweaters and I love black and white dress. There are even items for males, which is a great idea, even though boys are minority on Stardoll. On Thursday, surprisingly, we got new Callie's Picks Decor collection - "Winter Garden". I really love how Callie chose and set items up. The room presented looks fantastic, and I would definitely love to have a cup of coffee in a place like that. If they replaced monkeys with cats. We have some clothes too, a Stardoll pal, and the background is fantastic. 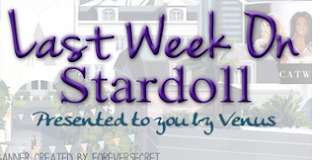 On Friday, Stardoll released new Ink'd collection. Even though I love tattoos, and I love the idea for the store, I am not really into buying items when I already have similar ones. (Oh, who am I kidding, I'm gonna probably end up buying all of them.) Piercings look great, and I love rose print on some tattoos. There are even tattoos specifically designed to fit male dolls as well, which is ok, as we have them too fit for female dolls. And finally, yesterday Stardoll announced February HotBuys. Not much to say here. They are ok, decent, except for few pieces, overall, the collection is fine. My favorites are pencil skirt and black/beige sweater. (More sweaters?) But now that I am summing up this post, seems like all the releases were winter themed, and I prefer summer clothes. That is all. I know my post is a bit shorter than usual, I am just not really in the mood for writing, but still won't let you down. Now vote, comment, and see you next week.